Dry mustard --- 1/4 tsp. Simmer beans in the same water until tender, approximately 1 to 2 hours. Drain and reserve the liquid. 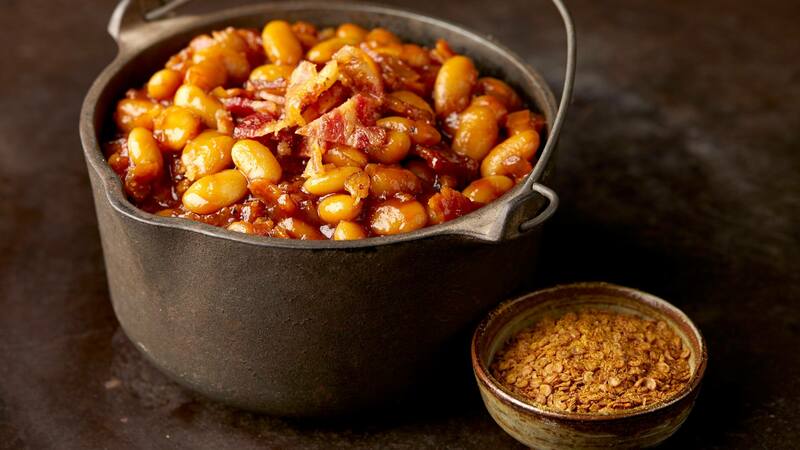 Arrange beans in a 2-quart casserole dish by placing a portion of the beans in the bottom of the dish and layering them with bacon and onion. In a saucepan, combine molasses, salt, pepper, dry mustard, ketchup, Worcestershire sauce, TABASCO® Crushed Red Pepper and brown sugar. Bring the mixture to a boil and pour over beans. Pour in just enough of the reserved bean water to cover the beans. Cover the dish with a lid or aluminum foil. Bake for 3 to 4 hours in the preheated oven, until beans are tender. Remove the lid about halfway through cooking, and add more liquid if necessary to prevent beans from getting too dry.